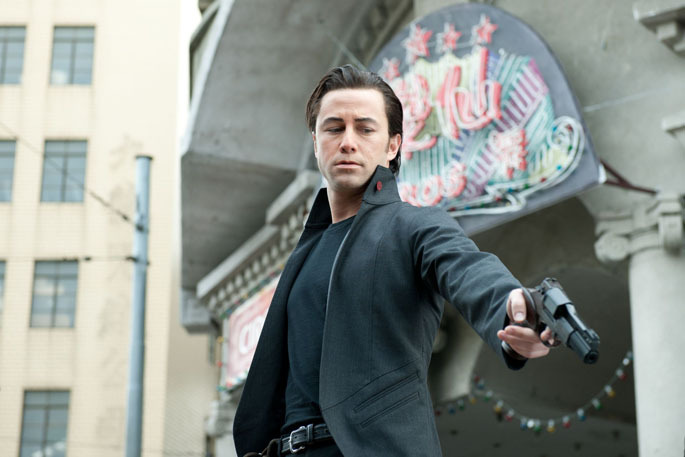 As soon as Looper started up with some Brick-style hard-boiled talk of mob bosses, blunderbusses, and time travel, I began to have that feeling, that realization that this film is going to be a thing, that people are going to blog about it and talk about it and cite it as criminally underrated (or overrated) for years to come. It's the midpoint between Christopher Nolan blockbuster and Winding-Refn sleeper (but with a better sense of humor than either), a solid genre film with independent grit. Joseph Gordon-Levitt stars as the younger version of Joe. Joe is a 'looper' for a criminal syndicate, which means he's employed to kill and dispose of bodies sent from the future. We're told that time travel hasn't been invented yet, but in thirty years it will be. Joe's good at his job, he doesn't ask questions and he stores up his silver knowing that one day his future self will be sent to him for execution and he'll retire to live out his next thirty years in peace. Of course, when that happens, things go awry. Old Joe (Bruce Willis) has a life he's not ready to part with and a desire to change the outcome of the future. The timelines meet, the future is in question, and the mob is out to kill both parts of Joe's loop. All of this, of course, takes place in a not too distant depressed dystopian future where vagrants wander the streets and shooting someone point blank for coming too near your shiny car is played off as par for the course. There's just enough excuse for a strange evolutionary human mutation, and just enough reason to throw in a futuristic hover bike or two. Director Rian Johnson is a fan of the genre, and he seems to understand how important the odd surreal touch is to a film that generally plays its time travel elements as the norm. It's an exceptionally clever setup, and one that feels quite fresh. 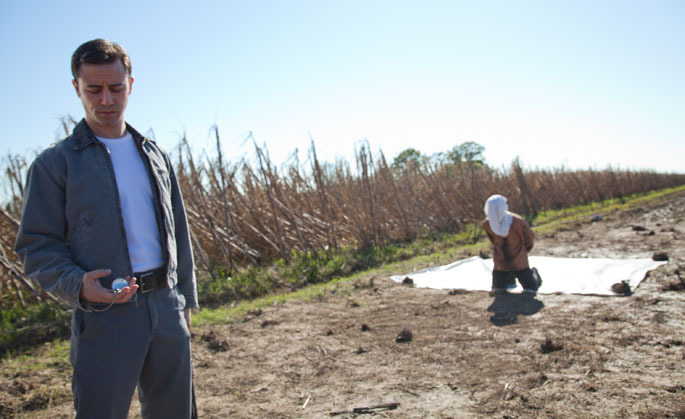 Looper is a legitimately entertaining film. You'll want to talk about it, and most of the ways Johnson has devised to deal with the inevitable questions are exceptionally sound. Still, a naysayer looking to poke holes in the complicated plot will find much to to latch on to here. Johnson covers up the potential issues well enough, but there are places where the film asks us to blindly accept a confusing logic that relates directly to the major, major events of the film. Can the events depicted actually alter the future? How much interaction does it take before the butterfly effect takes hold and all possibilities are destroyed? If you know (essentially) the day you're going to die, why don't more loopers disappear? How many people in the past are aware of time travel in the future? Doesn't that awareness impact its future use? 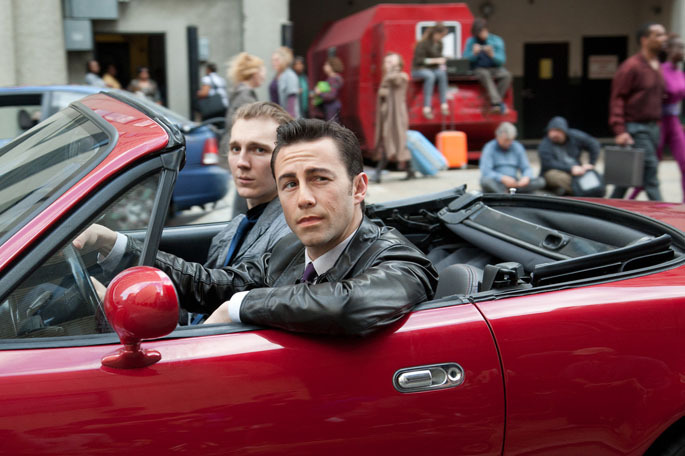 Also, did they really have to mess with JGL's face that much to make him a convincing Willis stand-in? My advice to you: as long as it's not wondering why JGL's lips look so made up compared to Old Joe, don't think about it. Just go with it. There's enough substance to the story outside of the scientific logistics and Looper uses its assets to pull the story in truly unexpected directions far away from the average formula. OMG - your reviews are torturing me! I want to see this so badly! Probably next week I'm gonna gave in and pay 12€ to enjoy this one! The idea of an actor having so much make up and alterations sounds a bit odd to me - I mean if the movie told me JGL plays younger Willis, I don't need much more. I hope it won't be too distracting for me. great review! I actually didn't mind the make-up because it took me away from my typical fan-girl mode over JGL and allowed me to be more objective. I find JGL to be too pretty to be a villain so the make-up in ways helped me distance myself from the character as a villain and yet his performance allowed me to connect with him as a hero.